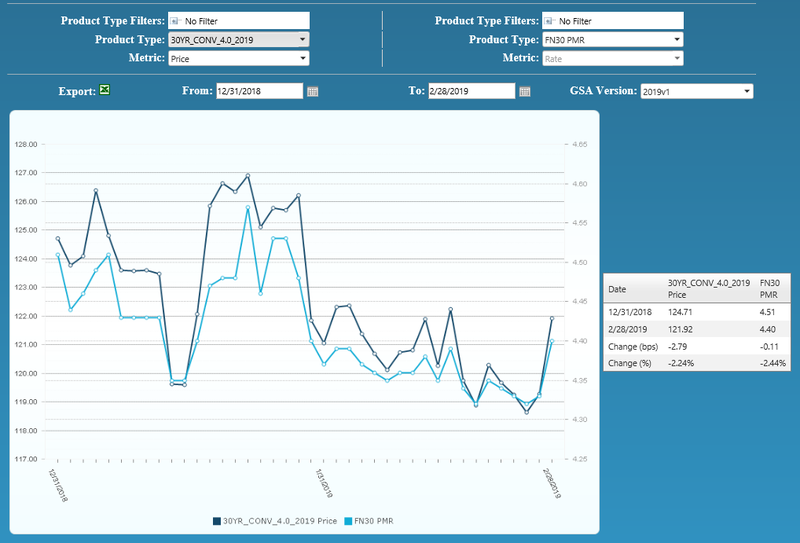 From end-of-month January to end-of-month February, the MIAC Generic Servicing Assets, (GSAs™) Conv_30 Index increased by 0.60% and the GNII_FHA_30 index increased by 0.35%. In larger GSA cohorts, which are actively traded in the MSR market, the Conv30_3.5_2016 and increased by 0.72% and the GNII_FHA30_3.5_2016 cohort decreased by 0.07%. During the month of February, Conv_30 Index OAS’s widened to close the month at 698.1 bps for an increase of 4.9 bps. Likewise, GNII_FHA_30 Index OAS’s widened to 791.6 bps for a month-over-month increase of 11.0 bps. After 3 consecutive months of falling rates, resulting in a 38-bps decline from end-of-month October ‘18 to end-of-month January ‘19, Bankrate® showed some stability in February by closing three (3) bps higher to end the month at 4.40%. With some MSR trade levels seemingly oblivious to the rate decline, February’s stability comes as welcome news to most buyers and sellers. Likewise, volatility is having little impact on most economists who like the MBA believes that rates will make up for lost ground and by the end of 2019 will settle around 4.80%. It’s this rising rate forecast, falling prepayments and the fact that many portfolios are still out of the money that is keeping buy-side interest as strong as ever and at historically attractive execution levels. 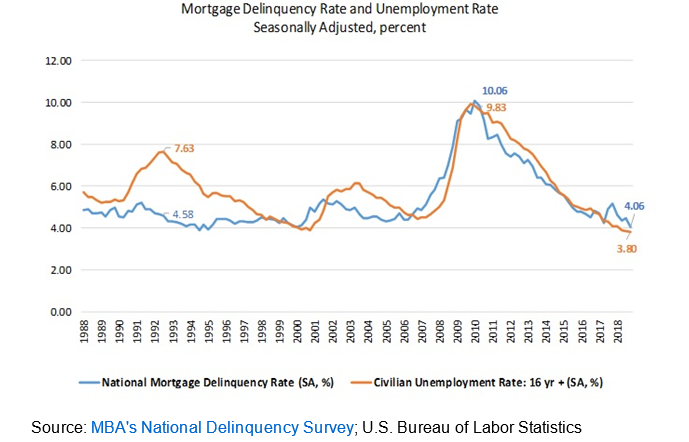 During the month of February, MBA Research released its 4th quarter of 2018 National delinquency results and its correlation to unemployment rates. The delinquency rate for one-to-four-unit residential properties dropped to its lowest level since the 1st quarter of 2000 and at 4.06% was down 41 bps from the previous quarter and down 111 bps from the 4th quarter of 2017. This occurred at the same time the unemployment rate was 3.80 percent and nearing 50-year lows. According to statistics released by CoreLogic, homeowners with a mortgage saw their equity increase by 8.1% year over year for an average increase in home equity of $9,700. However, the same report noted that from the 3rd quarter to the 4th quarter, mortgaged homes with negative equity increased by 1.6% to 2.2 million homes which today represents approximately 4.2% of all mortgaged properties. While equity is growing, at least in the 4th quarter of 2018, debt grew faster. The renewed popularity of cash-out-refinancing, seconds, slowing home price appreciation and lower down payments on inflated purchase values is something that should be routinely monitored. In January of this year, Conv30 MBS Prepayments hit a 10 year low of 6.6%. 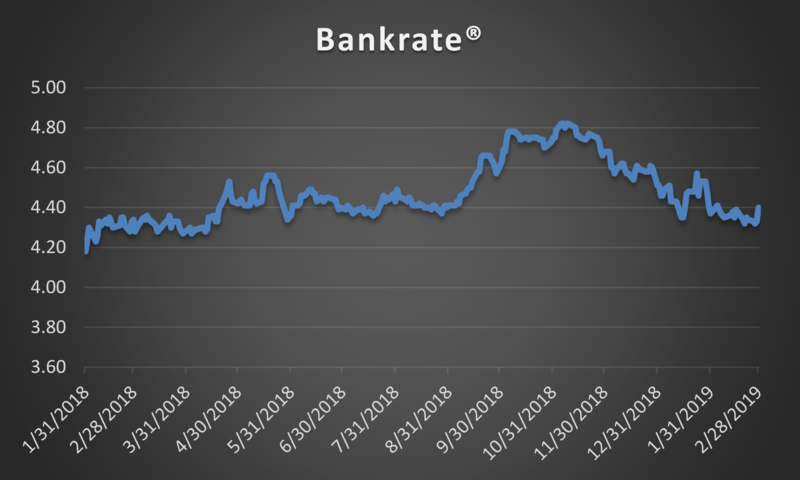 Due in part to the 4th quarter rate rally and aging, only the 2018 vintage 4.5% and 5.0% coupons posted an increase. Aging affects both premiums and discounts; however, premiums tend to reach their peak prepayment speeds considerably earlier than discounts thereby causing the now marginally “in-the-money” coupons to prepay faster. Likely due to a combination of seasonality, the media effect on falling mortgage rates, and another 14 bps drop in primary mortgage rates during the month of January, speeds picked up some in February but only by 10%. At an overall 7% CPR, Conv30 MBS prepayment speeds were still moderate by historical standards. Rising home prices, lack of inventory, seasonality, and burnout have been mentioned as contributing factors to the change in speeds but regardless, “for the moment” servicers can rejoice in the resulting prolonged cash flows. As we advance into March, due to seasonality and an increase in day count vs. February, projections are that March speeds will be 20% higher than February. Out-of-the-money Ginnie Mae’s have been posting faster prepayment rates than conventional MBS out-of-the-money discounts but Ginnie Mae’s crackdown on outlier servicers has led to lower and more predictable prepayments. The one exception to falling prepays rates is in the Non-QM sector. Default rates in the Non-QM sector have been low but largely due to the higher note rates, prepayments remain high. Posted 19 Mar 19 in MSR Market Updates.